What Happens When Diabetic Eats Sugar? Whether eating sugary food or just plain bread, the body breaks them down and converts them into glucose, or simple sugar, because the body primarily uses this form of energy. In diabetics, the body lacks enough insulin to help absorb glucose in the bloodstream, or doesn't respond to insulin at all. Glucose levels in diabetics can build up and cause health complications. 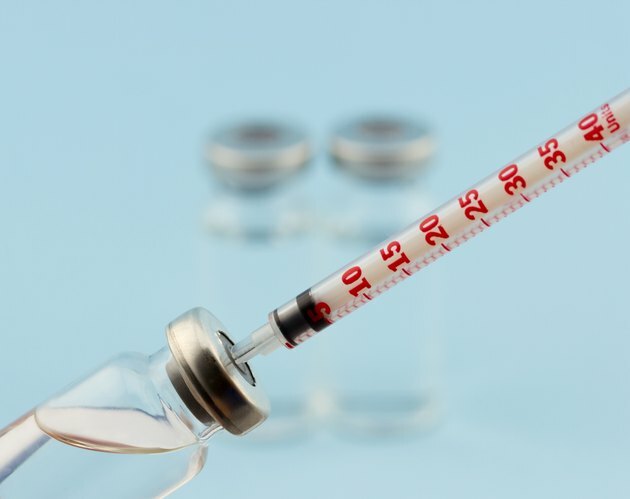 Insulin, a hormone produced and secreted by the beta cells in the pancreas, has a special role in the regulation of glucose levels in the blood. When blood glucose levels rise above the normal concentration, the body responds by secreting insulin, which plays a significant role in relocating the glucose transporter Glut4 next to the cells for absorption of glucose, so the body can use it for energy. According to the National Diabetes Information Clearinghouse, or NDIC, the normal glucose level in the blood of people without diabetes is between 70 to 120 mg/ dl before a meal. After a meal, the blood glucose level should rise, but should drop back to the normal range one to two hours later. A person with type 1 diabetes has dysfunctional beta cells because the “body’s immune system has attacked and destroyed them,” according to the NDIC, thus the body can’t produce insulin. When a type 1 diabetic forgets an insulin injection or doesn’t get enough insulin, eating a meal can raise the level of sugar significantly in the bloodstream, thereby inducing hyperglycemia. The NDIC explains that people with type 2 diabetes begin with normal functional pancreatic beta cells, but over time, the fat, muscle and liver cells can no longer respond to insulin properly. To bring the blood glucose level back to the normal range, the beta cells produce excess insulin. However, the beta cells will eventually lose their efficiency and can't produce enough insulin, thus resulting in insulin deficiency. Similar to a person with type 1 diabetes, a type 2 diabetic who doesn’t get enough insulin will develop hyperglycemia after eating a meal. The American Diabetes Association, or ADA, lists the following symptoms of hyperglycemia: polyuria, the tendency to urinate all the time; glycosuria, excess sugar in urine; and polydipsia, frequent thirst. Polyuria occurs when a great amount of water enters the kidney tubules due to the large presence of glucose molecules. The water in the kidney tubules eventually excrete out as urine. Because diabetics lose so much water, they tend to feel dehydrated--and thirsty--all the time. The ADA warns that a person with hyperglycemia who isn’t receiving proper treatment can develop serious health complications. When there isn’t enough insulin in the body, the cells can’t use glucose for energy, thus they use fat, then muscle, as a last resort. The breakdown of fats produces a byproduct, ketones, which the body will clear away through urination, but excess ketones will eventually build up in the tissues and bloodstream, thus leading to a condition called ketoacidosis, or diabetic coma. This condition can cause shortness of breath, extreme dry mouth, nausea and vomiting. Is Eating Too Much Sugar Bad for the Pancreas?